When it comes to effectively and meaningfully reaching your audience, I think it’s pretty safe to say that all marketers understand the important role social media plays in that quest. 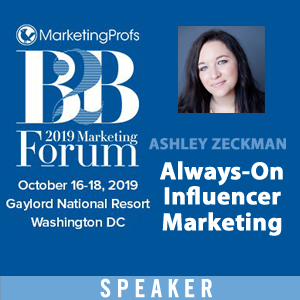 Not only does your audience seem to live on social networks—posting vacation selfies and checking into newly opened restaurants—but they also rely on them for information, entertainment and engagement. As a result, social media marketing has become a necessary tool for meeting your audience where they are. And it’s all about creating a connection with your audience by encouraging them to engage with you and the quality, informative and entertaining content that you share. Unfortunately, inspiring that consistent and meaningful engagement can be challenging at times, am I right? First of all, you’re competing hard for your audience’s attention. I mean, everyone is on social media these days. 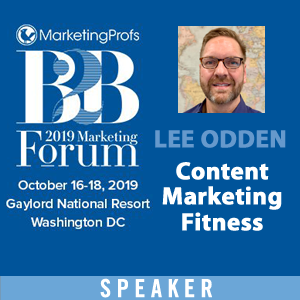 According to the Content Marketing Institute and MarketProfs 2016 Benchmarks, Budgets and Trends—North America reports, 90% of B2C and 93% of B2B marketers say that social media is the most used content marketing tactic, outside of blogs. In addition, you may not have a social strategy in place or are working with limited resources, which can hinder your ability to maintain a consistent social presence. But the good news is that there’s several things you can do to give engagement a nice little boost. And the great news is that anyone can do them—and that’s why we’re calling them hacks. 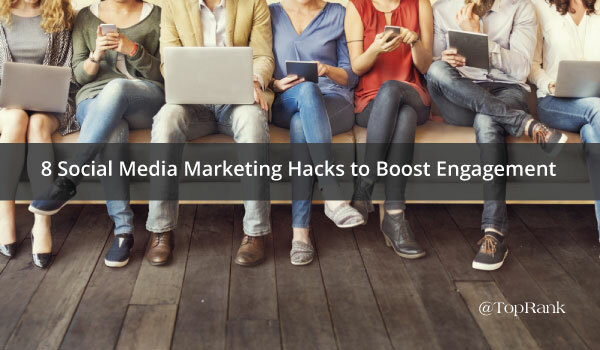 So, without further ado, here are eight easy hacks that can lend your social media marketing strategy a hand and boost audience engagement. #1 – Ask interesting and creative questions to get a conversation going. One of the best ways to engage your audience, is to simply ask them to do so by posing thought provoking, interesting or creative questions. To get the best reach and to catch their eye, include a video or image with your question. ModCloth is a popular women’s clothing brand that offers vintage-inspired clothing and accessories for every body. They do a great job of showcasing their brand, while also encouraging audience engagement through questions. This Instagram post is sweet and simple. Going up just a week ago, it already boasts over 6,700 likes and 67 comments. Polls are any easy and effective way to generate engagement because they don’t require a lot of effort to participate in. They’re also a fabulous way to get new information about your audience. 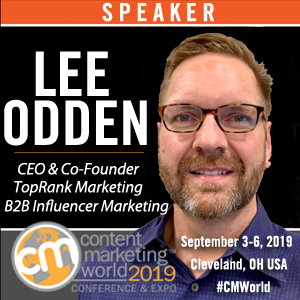 For example, TopRank Marketing’s CEO Lee Odden conducts a weekly Twitter poll to engage his followers, as well as mine for interesting insights. How many searches do you think there are on Google each month? #3 – Tag and mention commenters, sharers or those you’ve collaborated with. Tagging or mentioning other people or brands in your posts can lend credibility to your post, as well as notify those your tagging that they’re being talked about and compel them to share with their audience. If you’re sharing content that could include multiple tags or mentions, don’t go too overboard and try to fit them all in. This doesn’t create a good user experience for your audience, nor does it give the people or brands you’re mentioning enough credit. Instead create multiple, unique posts that are more personal and schedule them out over a few days. This one may seem like a no-brainer to some, but it’s definitely still worth mentioning. Hashtags help people find your social content, so including them where they’re relevant is a must. To find relevant hashtags, search social media networks natively or take a look at databases such as Hashatit or Hashtagify.me. Also, do some research on hashtag best practices for each social network, as they often vary. 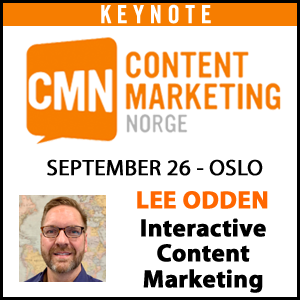 #5 – Use compelling images and video. It’s been said before and I’ll say it again: humans are visual creatures. In fact, research shows that an estimated 90% of the information that comes to our brains is visual. So, using interesting images and videos as part of your social media marketing strategy will get people to stop and look or watch. Take advantage of opportunities to give your audience a sneak peek at new products or events. These types of posts often do well because you’re inviting your audience to be a part of something unique. # 6 – Use current events to spark timely engagement. Interesting events and news items are never in short supply. Use them in a relevant way to spark conversation and encourage people to share their thoughts. Take a look at the trending news topics sections on Twitter and Facebook to see what people are talking about. Google News is also a helpful spot to find interesting topics. # 7 – Launch a cool contest. While social media contests are a common engagement tactic, you can’t argue their effectiveness when done right. Create a contest that is unique and easy for people to participate in. 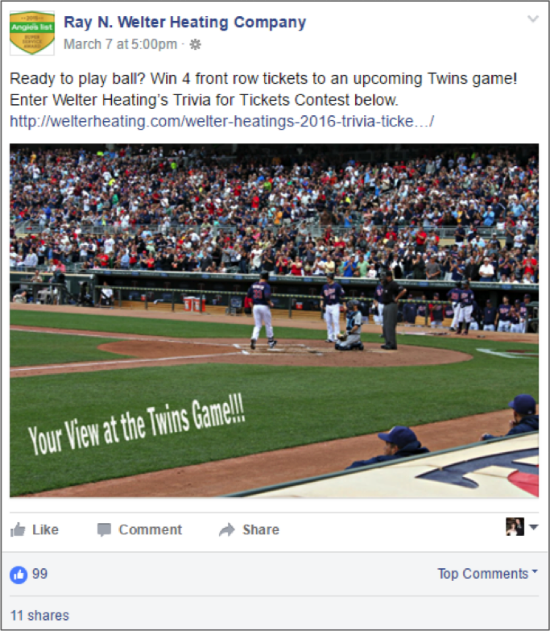 As an example, Welter Heating, a family-owned HVAC company to put on a social media trivia contest, with the prize being a set of four front row tickets to an upcoming baseball game. The goal was to drive social awareness and engagement, as well as website traffic. In the end, we saw a 166% increase in overall website traffic as compared to the same period the previous year. If a contest makes sense for your brand, make sure that you abide by specific contest rules that are outlined by the different social networks to avoid any penalties. #8 – Utilize social media management and engagement tools. While the above seven hacks are easy and effective, they can only reach their full potential if you’re consistently posting and engaged in what’s happening on your pages. Social media management and engagement tools can be easily integrated into your daily routine. They typically give you a place to schedule your posts and also help you keep up on social activity, so you can respond quickly and keep conversations going. There are a number of tools—both free and for a fee—out there. Some of those include: Hootsuite, Tweetdeck, Sprinklr, Spredfast and Buffer. Choose the one that best matches with your budget, goals and the networks you’re using. All in all, there are dozens and dozens of things you can do to more effectively engage your audience. Hopefully, these hacks provide you with a place to start building your engagement efforts. Just remember, social media is all about building that relationship. So, be consistent, be creative and be compelling. 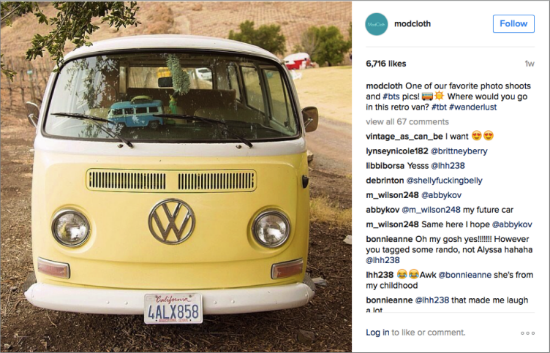 What are some of the social media marketing hacks that you use to boost engagement? Tell us in the comments section below. Disclosure: Welter Heating is a TopRank Marketing client. Very solid tips Caitlin! Thank you! You’re so right. Thanks for reading! Wow! Those are really cool hacks for any social media strategist.. I am so glad to come across your article Caitlin. Will surely implement few of those in my strategy. Keep it up…. !